Leaked Marvel Legends Hail Hydra two-pack featuring Secret Empire Captain America – AiPT! Nick Spencer’s Hydra Captain America is getting an action figure. While New York Comic Con is underway new reveals are coming fast, but it looks like a leak from bigbadtoystore.com has surfaced a big Marvel Legends reveal. The two-pack includes “Supreme Captain America” and Arnim Zola figures which spun out of the summer 2017 event Secret Empire. 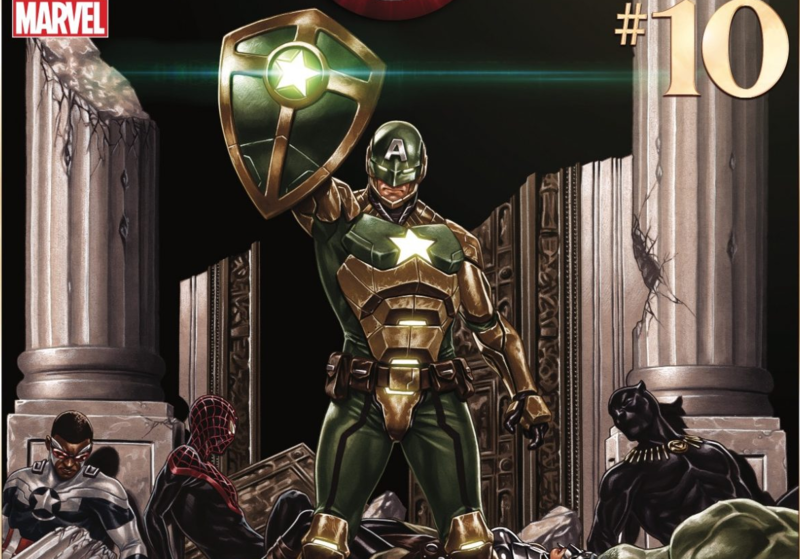 The series, written by Nick Spencer, was about Steve Rogers being a secret Hydra agent all along and what happens after he overthrows the heroes of the world. Emblazoned in Hydra Gree, the set is up for preorder for $43.99 right now. Featuring comic-inspired design, premium articulation and detailing, and character-inspired accessories, these terrific Marvel Legends Arnim Zola and Supreme Captain America 6-Inch Action Figures are really something! The 6-inch Supreme Leader Captain America and Arnim Zola figures are highly articulated, and with the comic design, they’re truly worthy additions to the Marvel Legends Series and your legendary collection. According to BigBadToystore, the two-pack will release in March 2019.